Update: Google Analytics has released an Add-on for Google Spreadsheets built on top of magic script. It's easy to install, requires no coding, and takes care of the authorization piece for you. For more information check out the add-on usage guide. Google Analytics Report Automation (Magic) is an integration that reduces the work required to put Google Analytics data into any Apps Script supported product, such as Google Docs, Sites, or Spreadsheets. The Google Analytics API allows you to export data so that you can perform analysis and create custom reports to answer questions important to your business. However, many users are looking for a simple way to put Google Analytics data into a Google Spreadsheet. Once the data is inside a Google Spreadsheet, users can easily manipulate Google Analytics data, create new visualizations, and build internal dashboards. Google Analytics Report Automation (Magic Script) simplifies this process and makes it easy to get the data you want so that you can focus on analysis and reporting. 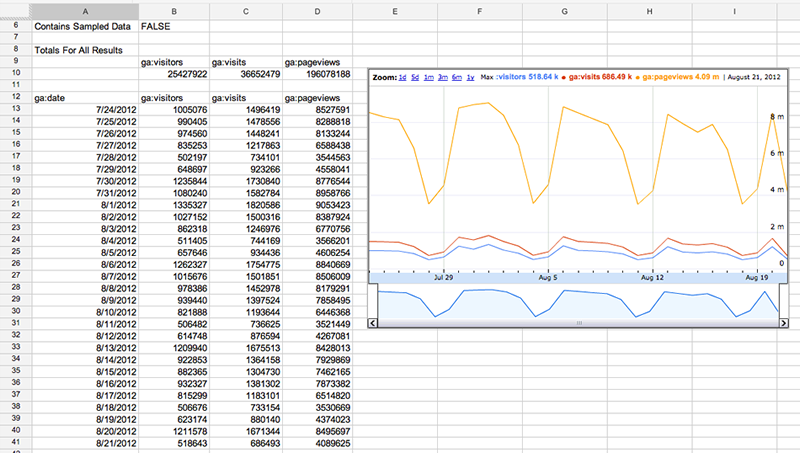 An example of Google Analytics data accessed through Apps Script and displayed in a Google Spreadsheet. A popular use case for report automation is to create dashboards that automatically update. The Google Analytics Report Automation (Magic) script is available in the Google Spreadsheets script gallery and can handle all of this work for you - no code required. This script is a great template for starting your own project. You can find this script by opening or creating a Google Spreadsheet, clicking Tools -> Script Gallery and searching for analytics. Look for Google Analytics Report Automation (magic).